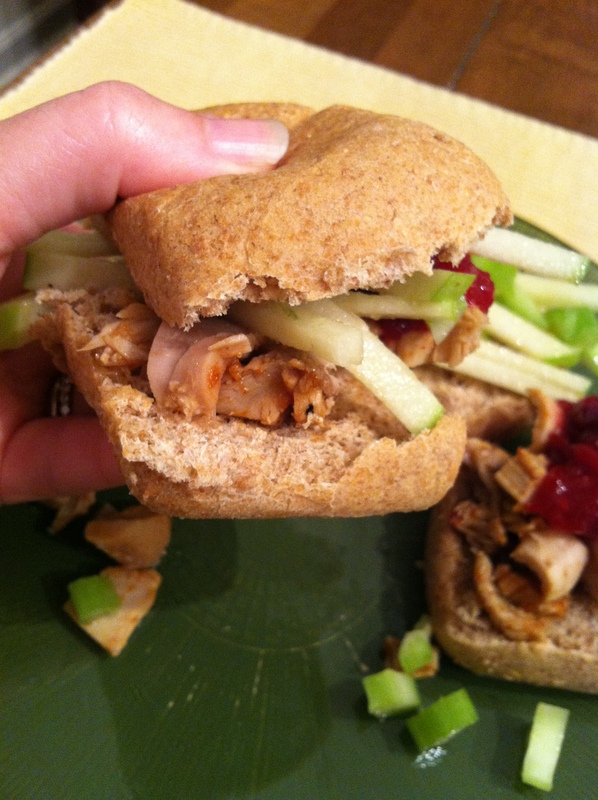 Simple Apple Slaw on Cranberry BBQ Turkey Sliders | Small, but valuable. Well, it turns out that making an entire turkey for two people means meat for at least two weeks. We’re still working our way through last week’s turkey. 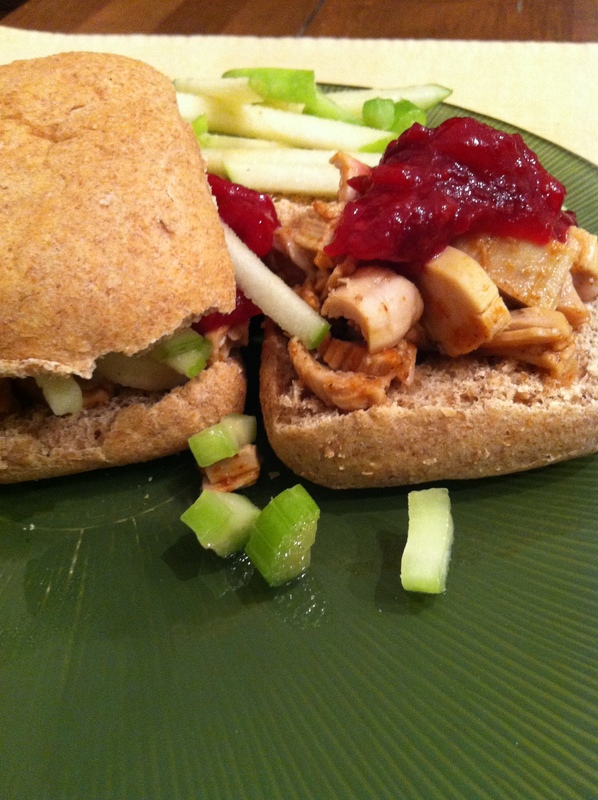 Last night, that meant trying out Giada’s Cranberry Barbeque Sauce Turkey Sliders. It was good, even if I edited it a bit to make it easier. In fact, I made it a lot easier. And the key take-away points? Making things easier is always fun. Apple slaw is something you should try, and soon. The slaw was the winner here. It was a fun texture, super easy to make, and the dressing was just enough to notice. Lovely all around! Combine the cranberries, maple syrup, cinnamon stick, orange zest and orange juice in a medium saucepan. Bring the mixture to a boil. Lower the heat and simmer for 10 minutes, stirring occasionally with a wooden spoon. Using the back of your spoon, lightly mash the cranberries to desired consistency. Chill until ready to serve (or serve warm like I prefer it). While the cranberry sauce is simmering, chop up the apple and celery ribs, then put them into a medium bowl. Combine the other slaw ingredients (small quantity of dressing) in a jar or bowl and mix, then pour over celery and apples. Place the turkey into a large bowl and pour the barbeque sauce over the turkey, stirring to coat evenly with the sauce. You can serve the meat cold or warm, so just microwave or heat in a saucepan if you prefer your turkey warm. To serve, toast rolls in a toaster oven or actual oven until warm, place turkey onto the bottom half of the roll, add a small amount of cranberry sauce over the turkey (a little bit of tart goes a long way), and pile apple slaw as high as you can without toppling the entire thing into a heap on the plate. Then get that tasty little slider to your mouth as quickly as possible.